On this side of the earth, spring is finally here! After months of cold, frosty mornings, the first signs of spring are starting to peep through! Merion is celebrating with a selection of patterns to crochet for the season! Spring is the season for glorious pastels, fresh, zingy greens and yellows, pinks and sky blues – suddenly we are breaking away from the rich rusts and burgundies, greys and deep purples, and lighter days demand brighter, lighter colorways. 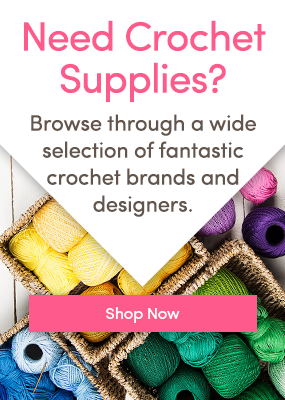 It’s time to crochet for yourself and for your home, and rediscover all those cottons, bamboos and blends that we’d put away in favour of warmer yarns! Thoroughly modern and up to the minute, this fabulous longline cardigan is a quick crochet project only uses four balls of Caron Simply Soft! Isn’t this just the most beautiful bunting for spring? Fresh, bright and such fun to make! If you want to brighten up the house, make it in gorgeous spring shades – in Paintbox Yarns Cotton DK or Paintbox Yarns Cotton Aran! Vicki Brown’s cool green shawl would look fabulous crocheted in Willow & Lark Woodland – a hint of tweed to bring texture but with the drape of merino wool blended with alpaca. I can see this in Cherry Blossom (421) or bright Honeycomb (411) but there are so many shades to choose from! Bring your favourite spring shades together for this riot of granny stripes! A perfect sweater for changeable weather, this is crocheted in Rico Baby Classic DK, but any DK yarn will work beautifully! Crochet a gorgeous pair of socks for yourself to welcome in the new season! Vicki Brown’s Spring Fling socks are beautiful in lemon, but any fresh shade would look divine. Regia Flower Power in the Festival colourway is beautifully springy! A super fast chunky crochet project, the Inmost Cardigan is a fun pattern for spring – it’s a handy extra layer that doesn’t add warmth so much as style! Paintbox Yarns Chunky Woolmix would work beautifully here, or you could add a little bit of texture interest with Stylecraft Alpaca Tweed Chunky! Brighten up your home with a beautiful spring blanket, full of bright pinks, lemons and greens! Rachele Carmona’s blankets can be made any size, and this Cottage Quilt hexagon blanket is absolutely beautiful! Great fun to make, you’ll love picking the colours for this in your favourite DK yarn. Spring can still be cool – so a cosy cowl is a great accessory to make, and I just love the combination of the pale pink and dark chocolate brown in Betsymakes’ Rose Chocolate Cowl! A simple shell stitch gives this cowl a dense texture but in DK yarn, it isn’t too bulky to wear in the sunshine! Crochet a rose for the ladies in your life! It’s Mother’s Day in the UK on March 11th, but around the world Mother’s Day is celebrated later during the spring. You’ve got plenty of time to work on something really beautiful for the mothers, grandmothers, aunties and favourite ladies in your life! Follow our tutorial to crochet a rose or two – you could sew them on to a bag or hat, make a corsage, or sew a brooch pin on the back to make a moveable decoration! What will you be crocheting for spring? 9 Crochet Gifts for Mother’s Day Swishy Crochet Sweaters for Spring! Crochet blankets for spring! Spring patterns for women! 2 Responses to Spring crochet projects to get your hook into!